Blackberries are an important fruit crop in Arkansas. Although the majority of varieties that are grown are traditional floricane-fruiting varieties, there is an interest in using primocane-fruiting types to provide berries at a time of year (late summer, early fall) when market prices are at a peak. Unfortunately, there is little information available on managing diseases and insect pests on plants that are fruiting at this time of year. In addition, high late summer temperatures can have a negative impact on primocane-produced fruit production and quality. The use of mineral particle films such as kaolin clay (Surround WP®) to lower leaf temperatures and protect plants from solar injury has been suggested as a way to enhance primocane fruit production. Experiments will be established on two commercial farms in northern and central Arkansas, (Sta-N-Step Farm near Fayetteville, AR, and Gillam Farms of Arkansas, near Judsonia, AR, respectively) and in eastern Texas to evaluate the effects of mineral particle film applications during the late season on blackberry production and on arthropod pests and diseases. We have had a successful first year in our project. Gillam Farms already had 2 year old established Prime Ark 45 primocane fruiting blackberries in production. However, Sta-N-Step planted 100 Prime Ark Traveler blackberries on April 22 and Moss Springs Farm planted 100 Prime Ark traveler plants on May 6, 2016. Drip irrigation was installed and landscape fabric was established on both sides of the row to help with soil moisture and weed management. Plants were allowed to grow during the summer (Fig. 3). A trellis system was installed in the fall on each row (Fig. 4). Plants were pruned as needed in January, 2017 to retain 5-6 healthy floricanes to ensure good development of the fall (2017) and 2018 primocane crop. A delayed dormant application of Sulforix (2% solution) was applied to both IPM treatments (IPM with and without Surround) in February. The plots will be fertilized according to soil test recommendations in April, 2017. 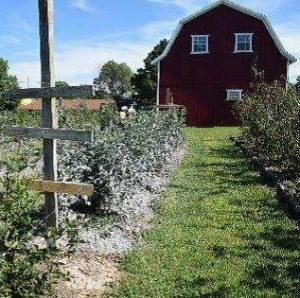 To demonstrate the importance of primocane-fruiting blackberries in commercial horticulture operations as a way to extend harvest in the fall when market prices are at peak. To demonstrate that high late summer temperatures in the southeastern states can be managed with mineral particle films (kaolinite) sprays. To determine if mineral particle film sprays can provide protection from various insects and diseases. John Clark, Distinguished Professor of Horticulture, University of Arkansas-Fayetteville, AR, was interviewed on video where he described the history of developing primocane-fruiting blackberry cultivars, recommended production practices and future research needs. Craig Rothrock (Co-PI), Professor of Plant Pathology, University of Arkansas-Fayetteville, AR, evaluated blackberry disease in three participating blackberry plantings until he retired in August 2017. Materials and methods: process involved in conducting the project and the logic behind the choices you made. Objective 1. 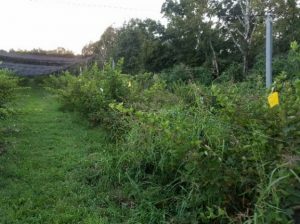 To demonstrate the importance of primocane-fruiting blackberries in commercial horticulture operations as a way to extend harvest in the fall when market prices are at peak. Methods: Three farms (Gillam near Searcy, AR, Sta-N-Step near Tontitown, AR and Moss Springs in New Boston, TX) will plant and/or manage primocane-fruiting blackberry plants spaced 0.7 m apart. Plot set up, treatment application and data collection will be supervised by Sanders at Gillam Farm (Searcy, AR), Kirkpatrick at Moss Springs (New Boston, TX), and Johnson at Sta-N-Step (near Tontitown, AR). At each planting, treatments were a randomized complete block design (four replications). These plants were trickle irrigated as needed. Treatment plots (listed under objective 2) each consisted of five to six individual plants arranged in a randomized complete block design (four replicates). 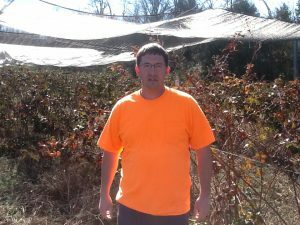 In 2016 near Searcy, AR, a seven-year-old Prime-Ark® 45 primocane-fruiting blackberry planting had four, 30 m (100 ft) rows (blocks) set aside for this study. 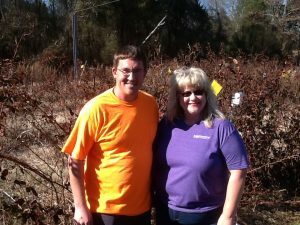 On 22 April 2016 near Tontitown, AR, 100 Prime-Ark® Traveler primocane-fruiting blackberry plants were planted in a 91 m (300 ft) long row and divided into four blocks. In April 2016 in New Boston, TX, 100 Prime-Ark® Traveler primocane-fruiting blackberry plants were planted in each of four 23 m (75 ft) long rows. After one year of growth in 2017, fruit were harvested by treatment plot twice weekly first from floricanes and later from primocanes at Tontitown and New Boston. Application dates for Surround mineral particle film (kaolin clay) are listed in Table 1. These applications were made to whitewash the canopy in hopes of lowering the canopy temperature which may affect yield and prevent damage by insects such as spotted wing drosophila and Japanese beetles. Surround was also applied to whitewash emerging green terminals to prevent broad mite outbreaks. Only rains exceeding 0.25” rinsed Surround whitewash off blackberry canopy requiring re-application to maintain whitewash appearance (Table 2). In 2018, the New Boston, TX planting was not whitewashed with Surround because the grower did not want to commit extra labor to washing off the white residue from harvested berries. In 2018, Surround was applied to plants up to July 23 in Searcy, AR and up to June 18 (first green berry) near Tontitown, AR to minimize white residue on harvested fruit. 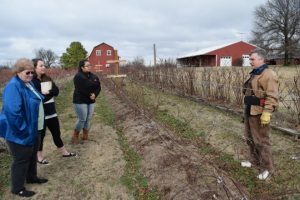 In 2018, plantings near Tontitown and New Boston had all floricanes pruned off at ground by bud break, removed from planting and fruit on primocanes harvested twice weekly. The grower at New Boston tipped vines in April, and pruned and tied canes to trellis on 22 May, 19 June and 22 Aug. From 18 June until early-July near Tontitown, the grower tipped emerging primocanes at height of 0.6 to 0.9 m (2 to 3 ft), tipped laterals at 0.5 m (1.5 ft) length and thinned each plant to 7 to 10 strong primocanes. The planting at Searcy was not harvested due to on-going sale of the property. Table 1. Dates of applications of Surround mineral particle film to whitewash blackberry plants in Arkansas and Texas. a Surround applied up to first green berry on primocanes in late-June to prevent white residue on harvested berries. Table 2. Rain gauge records of rainfall for Tontitown, AR where a rain exceeding 0.25” would rinse off the Surround mineral particle film whitewash from the blackberry canopy and require re-application. 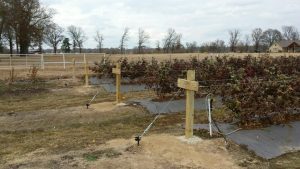 On 19 January 2017, the Tontitown grower was videotaped as he demonstrated winter pruning these 9-month old blackberry plants to retain four or five of the strongest floricanes (Link: https://www.uaex.edu/farm-ranch/crops-commercial-horticulture/sare-blog/sta-n-step-farm.aspx ). On 15 Aug. 2018, the project team produced a 59 min. 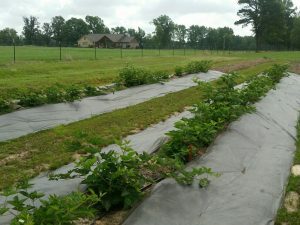 Virtual Field Trip titled, Fall Producing Blackberry Production System (Link: https://www.youtube.com/watch?v=TZnuW-KA5CQ&t=260s) at the Sta-N-Step Berry Farm near Tontitown, AR. In 2017 at New Boston, TX, the blackberry harvest totaled 96.7 lbs of berries from floricanes from 15 May to 12 June and 20.6 lbs of berries from primocanes from 29 July to 9 August (Table 3). In comparison, near Tontitown, AR, blackberry harvest totaled 13.5 lbs of berries from floricanes from 15 May to 12 June and 5.4 lbs of berries from primocanes from 29 July to 14 September (Table 4). There were significant differences in mean yields with the Surround only treatment being less than the Surround + Insecticide treatment on four dates at New Boston, TX (Table 2). The two dates with differences in Tontitwon, AR had the Surround plots yielding more berries than the insecticide treated plots (Table 4). Not sure why there were discrepancies between sites. In 2018, the floricanes had been removed before bud break so harvest was from primocanes only. 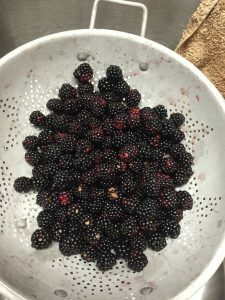 A total of 14 lbs and 11.7 lbs of berries, respectively, were harvested from the five plant plots of 2-yr-old Prime-Ark® Traveler blackberries at New Boston, TX (from 5 to 30 July) (Table 5) and Tontitown, AR (15 June to 14 September) (Table 6). Mean season total harvest weights per five-plant plot ranged from 2.5 lbs in untreated plots to 3.5 lbs. in plots whitewashed with Surround in May and June prior to green fruit development. There were no significant (P>0.05) differences in treatment mean yields in either location. This may be attributed to the fact that no Surround was applied to whitewash plants at the New Boston farm and the planting near Tontitown had five Surround applications from 10 May to 18 June when sprays ended at first green berry compared to applications in July and August 2017 (Table 1). This earlier whitewash cutoff date was to minimize white residue on harvested berries. Table 3. Biweekly and season mean total harvest yields in lbs (±SE) per treatment plot of five Prime-Ark® Traveler blackberry plants during two cane production periods (F = floricane = earlier; P = primocane = later) in each of four treatment plots (n=4): Surround whitewash; Surround whitewash + insecticide; insecticide; or untreated plants. The F and P values were derived from log10(x+0.1) transformed data from New Boston, TX (2017). Table 5. Twice weekly and season mean total harvest yields in lbs from 2-yr-old Prime-Ark® Traveler blackberry primocanes only by four treatment plots (n=4): Sur = Surround whitewash; Sur + Cide =Surround whitewash + insecticide; Cide = insecticide; or Untrt = untreated. There were no significant differences among four treatments (P > 0.05) in New Boston, TX (2018). Table 6. Biweekly and season harvest total mean yields in lbs ±SE (n=4) from Prime-Ark® Traveler blackberry primocanes only by four treatment plots: Sur = Surround whitewash; Sur + Cide =Surround whitewash + insecticide; Cide = insecticide; or Untrt = untreated. There were no significant differences among four treatments (P > 0.05) in Tontitown, AR (2018). Objective 2. To demonstrate that high summer temperatures in the southeastern states can be managed with mineral particle films (kaolinite) sprays. Canopy treatments include: 1) Sur = Surround® WP kaolin clay mineral particle film only applied weekly or as needed; 2) Sur + PM = Surround + pest management (PM) pesticide applied as needed plus conventional integrated pest management practices; 3) PM = PM treatment only; and 4) Untrt = untreated plants (check). Surround® WP was applied using a Stilh backpack airblast sprayer at a rate of 50 lb/acre to whitewash plants. Whitewash and/or insecticide residues were maintained by re-applying as needed after rains greater than 0.25”. In 2017, the Tontitown planting had four WatchDog 1000 series loggers (4 replicates) each inside a radiation shield set at 1 m height next to the blackberry planting to record ambient air temperatures. Recordings were made at half hour intervals from May 22 (before first Surround application) to August 31 (end of harvest). Each logger recorded temperatures from two micro sensor gator clipped to underside of separate blackberry leaves at 0.1 m and two at 0.3 m height inside the canopy of each of the four treatment plots (fig. 1). Mean ambient air temperatures were compared to mean temperatures from inside the blackberry canopy whitewashed with either Surround (Sur or Sur + Cide) or a green canopy (Cide and Untrt). Figure 1. Blackberry canopy whitewashed with Surround mineral particle film (kaolin clay). The air temperatures (ambient) next to plants were slightly warmer (more degree-days accumulated, base 50°F) than those in the blackberry canopy at 1 or 3 ft heights with or without whitewash of Surround. There was no significant difference between temperatures inside the blackberry canopy on underside of leaf on plants whitewashed with Surround kaolin clay or unsprayed (green) (Fig. 2). 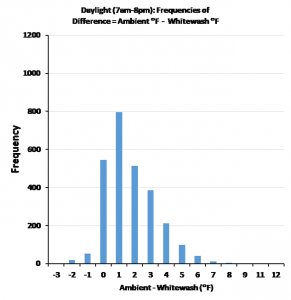 A difference comparison was made of temperatures of ambient air minus underside of leaves whitewashed with Surround for periods of no sun (night from 8pm to 7am) and sun (day = 7am to 8pm) (Fig. 3-5). 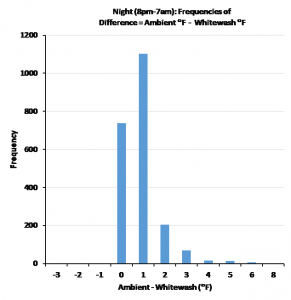 During the day, the ambient air was frequently greater than the whitewashed canopy by 0 to 6°F (mean of 2°F) compared to 0 to 3°F (mean of 1°F) at night which showed the heating effect of sunlight on air and canopy temperatures. Figure 2. 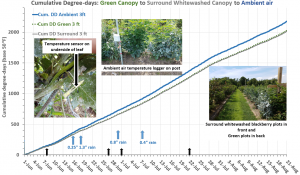 Cumulative degree-days (base 50°F) of ambient air (blue line), leaf inside canopy whitewashed with Surround kaolin clay (gray line) applied on 8, 27 June, and 1, 22 July (black arrows) leaf in untreated green canopies (green line). Rain exceeding 0.5 inches fell on 18, 30 June and 7 to 8 July (blue arrows) near Tontitown, AR (2017). Objective 3. To determine if mineral particle film sprays can provide protection from various insects and diseases. Sanders at Gillam Farm, Kirkpatrick at Moss Springs, and Johnson at Sta-N-Step will monitor treatment plots and decide when growers should apply recommended conventional pest management practices (2015 Midwest Small Fruit and Grape Spray Guide; Anonymous, 2015). These pest management decisions will be made by plot: using biweekly monitoring of baited traps for spotted wing drosophila (SWD) flies, leaves for broad mites and spider mites, fruit clusters for stink bugs, general plant inspection for other insect pests; and record severity ratings for presence of anthracnose, cane blight, rosette, or other diseases. During weekly harvest, all berries per plot will be collected and inspected for presence/severity of anthracnose and grey mold, and note the percentage of berries infested by SWD. Formulations of fungicides and insecticides and application dates are listed in Table 7. 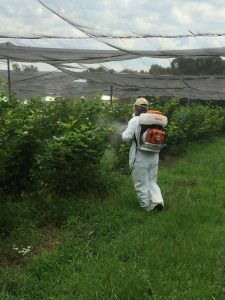 In New Boston, TX, the grower applied Bifenthrin or Ravage (Lambda-cyhalothrin) in 2017 or Malathion in 2018 for stink bugs. Near Tontitown, AR the grower used pto powered custom spray nozzles to apply fungicides to all blackberry plants for anthracnose control in 2017 and in 2018 and applied Imidacloprid for rednecked cane borer control in 2017. 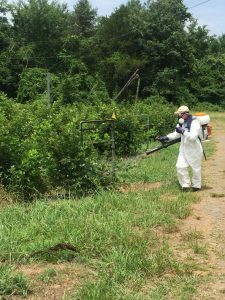 In Searcy, AR, a Stihl backpack airblast sprayer was used to apply fungicide to plots 2 (Sur + PM) and 3 (PM). Insecticide sprays against spotted wing drosophila were applied (re-applied after significant rainfall) to treatment plots 2 (Sur + PM) and 3 (PM) in 2017 and in 2018. The insecticide applied to treatments 2 and 3 included: Malathion 1, 3 July; Mustang Maxx on 12 June, 19 July, 26 August, 11, 22 September; and Delegate on 1, 10 August. These insecticides were applied to prevent damage to flowers by Japanese beetles (JB), damage to ripening berries by green June beetles (GJB) in July and SWD from early-June through 4 October. In and around the blackberry planting, there were low, sub economic densities of JB adults in June and July (Table 8) and GJB adults in July (Table 9). The GJB adults were mass trapped using 17 bottle traps placed 5m apart on fence in perimeter and baited with paper wicked pouched dispensing 50% isopropanol that captured 4,907 GJB adults. In an adjacent Natchez blackberry row there were ripe berries being fed on by GJB adults even after weekly applications of Mustang Maxx. Johnson is still analyzing SWD fly counts that emerged from fruit harvested from 7 September to 4 October and tabulating data from Searcy, AR and New Boston, TX. Table 7. Dates of pest management applications of fungicides and insecticides to blackberry plants in Arkansas and Texas. Table 8. Mean numbers of Japanese beetles captured in baited yellow funnel traps adjacent to two blackberry plantings in Northwest Arkansas (2018). Table 9. Mean per trap and total numbers of green June beetles captured in 17 baited (66% isopropanol) bottle traps set at 2 foot height on fence adjacent to blackberry planting near Tontitown, AR (2018). 10. Editing and posting the Virtual Field Trip with corresponding script re-posted on You-Tube and marketed to target audience including registrants who did not attend. The Virtual Field Trip demographics included identification at the time of registration of participants as “small fruit producers,” with a secondary evaluation question of “my primary occupation.” At registration 127 registrants identified themselves as small fruit producers. Live broadcast participants included 103 “small fruit producers,” with 33 identifying small fruit production as their “primary” occupation. Education was delivered during this project through a multi-platform blended learning strategy for adult learners. A dedicated web and blog landing page was created for this project, with over 250 posted and/or linked peer-reviewed educational resources organized and curated for this project’s target audience. Original contemporary content was authored and posted regularly in the blog by project research team members, which was featured on the project landing page (uaex.edu website). Curated educational resources accessed by clientele included information related to each farm research site, the goals and scope of this research, collaborators, risk management tools, and production resources for blackberry producers. Between 2017-2018, 2,818 the SSARE Blackberry Research Blog recorded 2,818 visitors to this page. An indicator of participant engagement in live/virtual educational programs is interaction. VFT participants submitted 126 comments and questions during the live broadcast, which is considered a high level of participant engagement for a program with 279 participants. Educational outcomes were measured for participants of the Virtual Field Trip related to knowledge gained, attitudes and intention to adopt technology/new practices utilizing a Qualtrics online survey. The evaluation was promoted during the broadcast and the survey link was disseminated to broadcast participants upon completion of the educational session. Survey design included question logic targeted to small-fruit producers with targeted questions related to farmer adoption and further dissemination. VFT survey respondents included 75 non-producer respondents and 18 respondents identifying themselves as blackberry producers. Ninety-six percent (96%/70) of overall survey respondents reported that they planned to share educational information learned through the Virtual field trip. Seventy-eight percent (78%/14) of producer respondents reports that they planned to adopt practices shared through the Virtual Field Trip. Twenty-two percent (22%/4) of producers responded that they might adopt practices shared. No respondents indicated that that would not adopt practices shared. •	The economics took up a lot of time that might not have been pertinent to a large part of the audience. You might consider a separate economics webinar immediately following the first. •	Please send me access to recording. 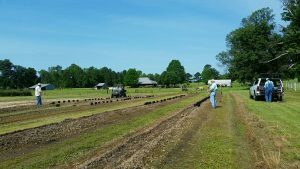 Les Dozier prepared a 300 ft raised bed row and installed drip irrigation by 22 April 2016 when he planted 100 Prime-Ark® Traveler blackberry plants 2 ft apart. 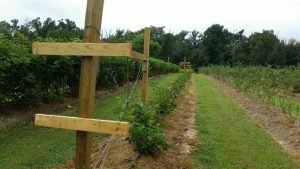 By 18 August, this row of blackberries were healthy, averaged 1 ft tall and Les had installed a trellis with two wires at 1ft and 4 ft heights . 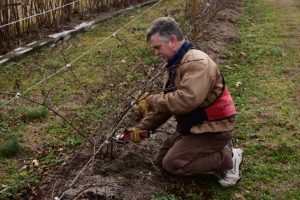 On 19 January 2017, Les discussed and was videotaped as he demonstrated and described how to winter prune these 9 month-old primocane-fruiting blackberry plants to retain four or five healthy floricanes to ensure development of 2017 and 2018 primocanes . The goal is to obtain mature plants by summer 2018. Canopy versus Ambient Temperatures: On 6 and 12 September 2016, each of four WatchDog 1650 loggers (4 replicates) in radiation shield records data at ½ hr intervals of ambient air temperature and %RH and temperatures from 2 to 4 microsensors pinned to underside of leaf in canopy interior in each of 4, 10 ft blackberry plots in each of two fields: 180 ft row of three 60 ft plots of mature primocane-fruiting blackberry cultivars (Prime-Ark®45, APF205, or Prime-Ark®Traveler) at the Arkansas Agricultural Research and Extension Center in Fayetteville, AR; and four, 40 ft rows of Prime-Ark® 45 blackberries at Gillam Farm near Searcy. In Fayetteville from 11am to noon on 12 September 2016, two plots in each section were either untreated or whitewashed with Surround WP kaolin clay. At each location, temperatures in canopy interior were 1.2 °F cooler than ambient air temperatures in loggers in radiation shields. In 2017, one of four treatments will be applied to 10 ft plots including: 1) whitewashing with Surround only; 2) whitewashing with Surround + PM practices as needed; 3) No Surround + PM practices as needed; and 4) untreated (control). One logger will be set at 3ft height just outside canopy of one the four treatment plots to measure ambient air temperature. This logger will record temperatures from its 4 temperature sensors pinned to underside of leaflets in lower canopy interior in that same treatment plot (4 reps. of temperature in each treatment plot). This will be repeated in the other three treatment plots. Treatment plot inner canopy temperatures will be averaged and compared among treatments and the ambient temperatures. Objective 3 analyzes the economic feasibility of primocane fruiting blackberries. Performing this analysis requires the collection of production and value data from project research partners. To ensure adequate data are collected, initial contact was made with participating farms. During this contact, they were asked to review data collection sheets that were specifically developed for this portion of the project. We will be scheduling meetings with farmers during year two to further discuss their production methods and ensure that values are being properly recorded using the data collection sheets. During year three, we will continue collecting data from producers. Once data collection is complete, we will use these values to update our Interactive Sustainable Blackberry Budget tool and estimate the economic outcome of primocane fruiting blackberry production under various scenarios. Later on 15 August 2018, Dr. Karen Ballard conducted a post evaluation of the team that participants shortly after the live Virtual Field Day on 15 August 2018. 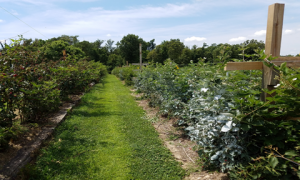 On 15 August 2018, as part of the SSARE project LS16-274, the University of Arkansas Cooperative Extension broadcast a Virtual Field Trip on primocane blackberry production internationally to registered sites including Ghana, China, Greenland, the United Kingdom, and to 30 states within the US. There were 279 participant locations including 177 small fruit producers, 114 Master Gardeners, and NIFA SSARE federal partners and CES research/extension personnel. LeFors, J., D. Johnson, and T. Woodruff. 2017. Acaricidal control of broad mites in blackberry, 2016. Arthropod Management Tests 42(1): <https://doi.org/10.1093/amt/tsx113>. Lefors, J.A., D.T. Johnson, T. Kirkpatrick, T. Woodruff, and G.J. De Moraes. 2018. A two step centrifugation method with water and sucrose to separate mites from raw extracts of tullgren funnels. Syst. Appl. Acarol.-UK 23(5):860-867. LeFors, J. 2018. 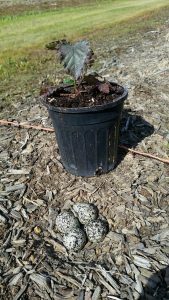 Seasonal phenology, distribution and treatments for Polyphagotarsonemus latus (Banks) on primocane-fruiting blackberries (Rubus L. subgenus rubus) in Arkansas. University of Arkansas, Fayetteville, M.S. thesis. Herrera, L. 2017. 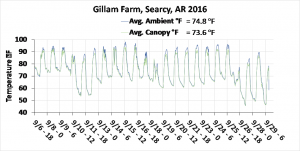 Seasonality and management of spotted wing drosophila on berry crops and wild hosts in Arkansas. University of Arkansas, Fayetteville, M.S. thesis. Knipps, R. 2018. Spotted wing drosophila (Drosophila suzukii) in Arkansas: wild hosts, winter morphs, and fungal control. University of Arkansas, Fayetteville, M.S. thesis.